Eternal Plaques and Eternal Flame Facebook photo album (click). Memorial Park is dedicated to honoring the service and sacrifice of all veterans and their families. Donated in 1883, the Park was re-designed and re-constructed through the efforts of the Drive to Revive Memorial Park Committee working with the Arlington Hts Park Foundation, Park District, and Village with the support of veterans, citizens, businesses and organizations throughout our community. 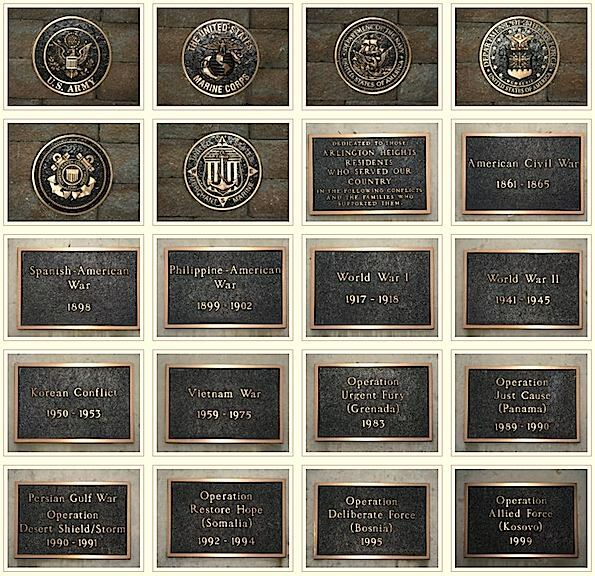 The new design of Memorial Park includes the seals of all six military services, a bronze timeline showing the 15 military conflicts since the founding of our village and – most importantly – commemorative bricks describing the military service of individual veterans. Each brick tells a story – of service and sacrifice. Taken together, the 450+ commemorative bricks currently in the Park tell a profoundly moving history of our community and of our Nation. Any veteran — from anywhere, from anytime (peace or war) — can been honored and remembered with a commemorative brick in Memorial Park. For info, log onto the Memorial Park website (above). 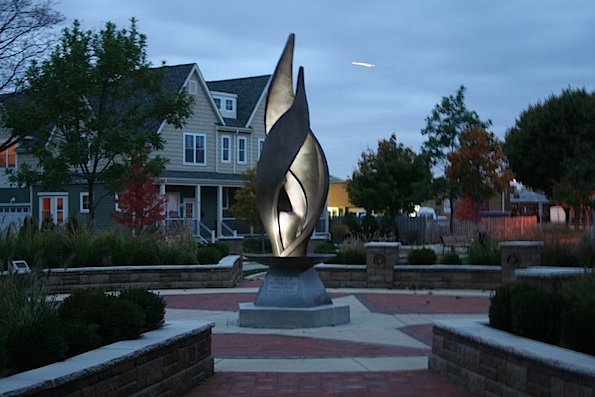 About the Eternal Flame sculpture…. Standing 15 feet tall, the Flame has been installed at the center of Memorial Park – surround by the veterans’ commemorative bricks. The Flame stands on a granite base with five sides. Eventually, each side will have an inscription. The first inscription reads “Because of our heroes and their families, freedom survives”. Also on that same day….. The Arlington Heights Historical Society will be presenting a Salute to Veterans. Just one block East of Memorial Park, the Tri-State Reenactment Society will offer a free breakfast for veterans only at 10:00 am. Breakfast will be prepared on an authentic WWII Army Field Kitchen (food has been great!). Veterans should RSVP to the Museum at (847) 255-1225. Please RSVP quickly as seating is limited to 60 veterans – first come, first served. After the dedication ceremony, at 1:00 pm at the Museum, the Tri-State Reenactment Society give talks on WWII and offer displays of authentic WWII equipment.